AFS, Days 2-4: Learning Stuff and Dropping Beats! | Meghan Kelly Teles! AFS, Days 2-4: Learning Stuff and Dropping Beats! We woke up on day 2 to clear skies highlighting the incredible terrain surrounding the Selkirk Lodge. It was 6 AM, but Hannah and I rushed outside to take photos and awe at the surrounding peaks. Hannah posing in front of Justice Mtn! After breakfast, our weather window had dissipated, but we had plenty of learning to do so we headed up towards Primrose Icefield assessing the snowpack as we climbed. On a NE slope, we dug a pit and talked about the layers of concern within the snowpack. There was a dominant crust layer about 70 cm below the surface and 20 cms of new snow in the past 24 hrs – which seemed like it make for some good skiing. We also did an ECT, which is the test I always gravitate towards since it shows both instabilities and propagation, and we didn’t see any movement. Safe and fun snow, but bad light, so we skied down to practice building snow anchors. Anne discussing the pit profile and ECT. Michelle demonstrated both ice axe and ski anchors. The key was to make sure the anchors were solid, but building them quickly enough to save your friend in the crevasse. 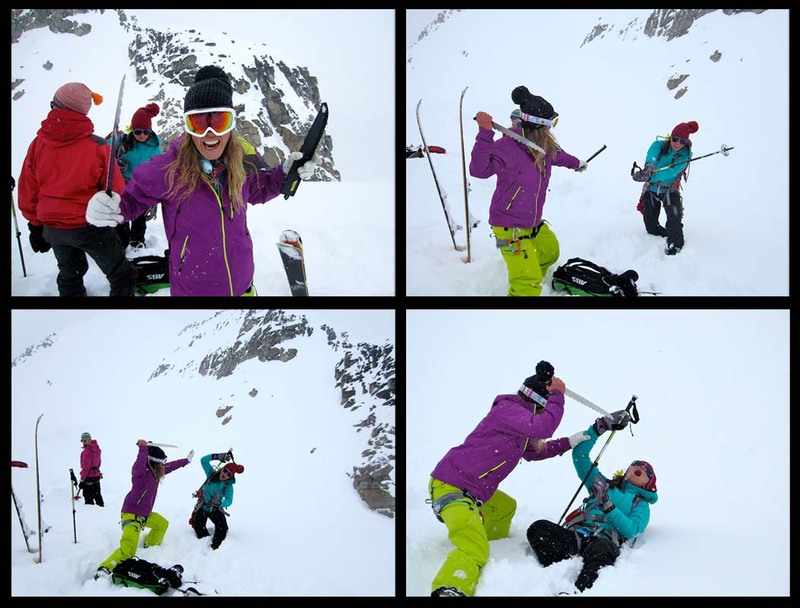 Most of our ice axe anchors failed, but the ski anchors were indestructible. After digging out, we headed back up to the Primrose Icefield, but the weather cacked out (this is an Anne-ism, the first of many) and Anne decided we should ski Wolverine. We de-skinned and joined Anne at the top of the run. It was steep and long. We were keen to fly Jesus at her (Anne-ism or Canadian-ism – translated – send it!). Dropping in in less than ideal light, I skied fast, emulating the speed of my freeskiing sisters and lost site of the guide’s track that set the boundary, but quickly recovered, skiing big turns to the bottom! “THAT WAS SO FUN!” Everyone skied in to the safe zone professing that sentiment in some way. It felt so good to get an actual run in good snow. I think we were all relieved to know that we were going to ski this week and it was going to be good! Who’s ready to ski Wolverine! This girl! We skinned back up to the lodge for the evening and started practicing our navigation skills. The metal deposit in Canada blew our minds. How did people figure that out? Why hasn’t anyone tried to exploit it? I’m sure I could Google it, but I’m hoping McKenna writes a book that I can read instead. Primrose is up there somewhere… just kidding, we know EXACTLY where it is. Speaking of raps, we didn’t summit since skiing in a whiteout would’ve been only somewhat fun and instead headed over to a wind scoop to practice rappelling and ascending. We were all excited to learn this skill. I know that many of us had been in couloirs with mandatory raps where we’d been dependent on others to set up the system for us. We also had a bit of fun installing the ski anchors. When we all had a chance to practice, we skied back to the lodge and worked on some of the knots inside. Again, knowing these skills is incredibly empowering and practice is key. Luckily there are parallels in both climbing and swiftwater rescue. Hannah is ready to rap… and I’m not talking about spitting rhymes! A little fun ensued while building anchors. After spending the majority of Day 3 learning, we woke up to clear weather on Day 4. I looked out the window and turned to my roommate Emily and said “Can you believe we are still here for 5 more days. This place is awesome.” She agreed. The group tried to get out reasonably early to ski Justice Mountain and practice safe travel on the Justice Glacier. We started off with a run down to the bottom of the glacier, which is a great way to start a day. McKenna and Kate looking down the morning run to the lake named after Kate. With the huge Intermountain snowpack and local knowledge, crevasses were not considered a large enough problem to warrant roping up on the glacier, but as we were skinning, we stayed 10 meters apart as a precaution. Reaching the saddle, weather moved in again and we were forced to abort the Justice mission, but were still greeted with a few thousand vertical feet of skiing. The top part was my first experience skiing in a whiteout on a glacier – the possibility of crevasses adds a mental aspect to the already challenging task of skiing with no visual perception. Once we were below the Justice cloud, it was fun low angle powder turns until our legs burned at the bottom. Skinning up amongst blue skies. HuhWHAAAAT! BC, if you don’t like the weather, wait 10 minutes. We headed over to practice skills like self arresting and walking on snow. We also practiced our acting skills (see video). Anne set up a roped crevasse rescue scenario and we watched the 3 guides work expertly as a team to extract “Jane” the bag, who had fallen into the crevasse. The take home messages for me were: when in doubt, back it up; prep the crevasse lip for the fallen person to be hauled out; and a Z drag is the way to go. Since the weather had turned cold and windy, we opted to skin back the lodge and practice some of these skills inside. However, on the way back, the light popped and we were able to get a few skiing shots. Ashley posing in the good light! So far, we had short weather windows and unideal light, but the camaraderie of the group and the overall setting kept our spirits high. In addition to learning new skills daily, singing 90s songs, synchronized skiing, dancing randomly, throwing snowballs, and an ever-evolving female freeskier rap kept us laughing and smiling. My best line was, “Want botox, how about a knee to the face, we got fat lips, scars all over the place.” It was just awesome to be around so many like-minded (and scarred) individuals and it was only day 4! Hannah hadn’t gotten Xtreme enough today, so she decided to take the alternate lodge entrance.